The Treaty of Rome was the Copernican revolution in the history of European democracy, the moment at which nationalism and the nation were consigned to history. Since the Lisbon Treaty, however, national self-interest has returned to Europe, so that today the question is: who will determine Europe’s future – the universal or the one-dimensional European? 1. In the first half of the seventeenth century, convincing the Vatican of the correctness of the Copernican world-view was, famously, impossible. The Pope, the Inquisition, the ecclesiastical dignitaries, the clergy preaching from the pulpits, and all their political allies, the Catholic counts, the kings and emperors – all held firm to the Ptolemaic world-view. And so did everyone else – out of habit, confirmed by experience: after all, they could see that the sun revolved around the earth, that it rose in the morning, that it moved across the earth and went down in the evening. It had always been thus, and it was reassuring to know that it would always be thus: God had put humans at the centre of the universe, where everything revolved around them, under the eyes of the Almighty. The certainty that life had a meaning, that a protective hand was resting over them despite their misery in this vale of tears, was, for good or for ill, bound up with the Ptolemaic world-view. Today you don’t have to have read a tenth of the number of books that, for example, Pope Urban VIII, a patron of the sciences, studied, to know better – and it was Pope Urban who had Galileo arrested and then forced him to retract. The interesting and strange thing about this is that such stubborn resistance against reason and knowledge was only possible because the world actually functioned on the basis of a false world-view. People sought a living, worked or robbed, guzzled and boozed, loved and hated, strove for recognition, obeyed laws, feared death or sought it, reproduced, died naturally or from violent causes, suddenly or after long suffering, in peace or embittered. Basically, there was nothing else under the Ptolemaic sun, and nothing new under the Copernican. World-views can be crazy, but people make do. Whatever it is that revolves, it keeps revolving. And then suddenly it doesn’t – suddenly a world-view that long seemed to function, and that in this particular historical phase corresponded to the needs and possibilities of human beings and their experiences, turns out not to function after all, and to prevent history moving forward. What was initially the crazy idea of a few people then becomes a commonplace even for the most limited of minds. The punch-line of the story – call it cynical, ironic or contingent – is that, according to demographic calculations, it was only in 1957 that, numerically speaking, roughly as many people lived on this planet who knew of and recognized the Copernican world-view as had believed in the geocentric one throughout the previous history of mankind. 1957. Without wishing to read too much into the coincidence, isn’t that odd? 1957 was the year of the Treaty of Rome, the treaty on the common organs of the European communities. It was the year the development towards the European Union officially and deliberately began, a Copernican revolution in the political and social world-view. You will, of course, complain that a new political world-view can’t be compared with a new scientific discovery. In a pragmatic sense, that is of course correct, as correct as the complaint of Pope Urban VIII: you can’t refute a religion with a telescope! 2. I have looked through the telescope and I have seen: nation-states will die. We now arrive at our topic: the European Union must inevitably lead to the extinction of nation-states. And rightly so. I won’t be able to convince the current political elites of this, nor the columnists of the national press and all the other high priests of national identity and the defence of national interests. Nor will I be able to convince them of the basic reasonableness of a post-national world-view. I may not be able to convince you either. Still, let me tell you: the sooner you understand and accept this fact, and arrange your life accordingly, the better for you and your children. That’s not an opinion. An opinion, as Hegel rightly said, is mine and is something I can just as well keep to myself. No, it is a fact. To be on the safe side, let me say in advance that I don’t believe that history has a goal, nor do I believe that it has a meaning. Historical processes, on the other hand, do exist; human life on this planet can only be conceived as the production of history, just as individual life is the production of biography, and only biography can fully determine who an individual is. To think historically and perspectivally is to establish meaning in the meaningless, to give form to the processes of life, rather than just to undergo them. In the world-view of the overwhelming majority of people today, the belief in the idea of the “nation”, the belief in its rational basis, the belief in the almost ontological and hence inextinguishable longing of human beings for “national identity”, has taken on an almost religious character. The tendencies and movements towards renationalization that we are currently seeing belong to the conflicts of faith and wars of religion that are erupting globally. Despite the historical experience of National Socialism and its bloody trail of death and destruction, the fact that countless people literally believed in it has not yet permanently shaken the faith in the idea of “nation”. When the national unification of Germany was just an innocent yearning, no one could eat a slice of bread and butter without proudly saying: “German bread! German butter!” You can read this in Wilhelm Raabe. Raabe was a master of sympathetic irony, which later was misunderstood as comfortable German humour and today is no longer even misunderstood. Today it sounds ridiculous, but whether ironic or absurd, the fun definitely ended when the dynamic inherent in nationalism developed fully, resulting in bloody wars of national unification and murderous wars of conquest, and in racism all the way up to the Holocaust. A short while later, the vegetarian Hitler called on the German people to give up margarine. Every gram of fat was needed for gun grease. Butter – margarine – gun grease. Excuse me for this ridiculous digression, but it is a topical digression, since I can hardly give you here the whole story of nationalism’s misery and splendour. I just want to ask you this: what are your needs and desires in life? Whatever occurs to you, take the butter as a symbol for it! Is that what you want? Nothing more than a substitute, than gun grease? As that which is appropriate to you? 3. I haven’t yet argued why nationalism and with it the nation will necessarily and reasonably die, but I already know what many people’s objection will be: must nationalism really be defined through its deformations? Can’t there be national pride, national identity, national feelings as a sense of belonging, without deformations, an open minded, welcoming and cheerful nationalism, so to speak? In other words patriotism – and what is wrong with patriotism? Why would one want to overcome the organization of mankind into nations at all? Do you remember? I don’t know how you see that in retrospect, but I can tell you that I found it absolutely not normal. In fact, I was shocked. For one thing, I don’t find it normal when supposed normality celebrates itself so enthusiastically. Second, I considered it progress that after 1945 there was a brittle but, after a while, clear consensus in Germany that nationalism is not to be trusted, or at any rate could never again be innocent and cheerful. What in 2006 was celebrated as “progress” (“we can again, we may again!”) was therefore a step backwards. Inherent in collective self-worship, cheerful as it may be superficially, is the outwardly directed resentment that, in times of crisis, doesn’t simply “erupt” uncontrolledly, but can be rigorously demanded and summoned for the sake of the coherence of the community. For that reason, thirdly and most importantly: I knew instantly that you only had to throw this flag-waving mass a stick, a hint as to who didn’t belong to this cheerfully resurrected national community, but on the contrary threatened it – and that would be that with cheerfulness and newfound innocence. It didn’t take long before the community finally found its enemy: “the Greeks”. Didn’t you notice anything? It’s characteristic of the method by which nationalism cements the collective, namely to perceive the world outside it as a world comprised solely of other collectives. The Greeks – they are lazy and corrupt, the Greeks live off our money. It was unbelievable how quickly the mood could be turned to anger and resentment against an abstract collective, the Greeks, almost identical headlines in the Frankfurter Allgemeine Zeitung and Bild – would you have believed this possible ten years earlier? It was rabble rousing, racism pure and simple. Do you find that normal? I’ll tell you what I think: yes, you find it normal. Because every day you’ve been given a tiny bit of the poison, and as the dose was increased, you found that to be normal, and simply learned to believe that there was something to these arguments “justifying” racism. Ultimately, there can be no normal nationalism without deformations, just as there can be no roast pork without pork. People lead their lives in the given circumstances – that is normal. And only in that particular set of circumstances does a false world-view appear to function and to correspond to people’s experience. One can alter circumstances, however, and if one doesn’t, they alter anyway. 4. The theoreticians and stalwarts of the idea of the nation argue that it is inseparably bound to that of democracy and autonomy, as well as the guarantee of rule of law. The progressive relinquishment of national sovereignty hollows out democracy and leads to increasing heteronomy. This argument is so historically blind that it’s hard to know whether to call it dangerous or eccentric. The history of European nations has shown time and again that the people unified by the nation are, in many countries, in the most part prepared to put up with practically any form of tyranny as long as the fiction of the “defence of national interests” is maintained. Since their respective foundations, European nations have experienced longer periods of war, totalitarianism, fascism and foreign rule than periods of freedom and democracy. Take the German nation: cobbled together through a war of unification with sword, blood and tears. And then immediately after that the Franco-German war. Then a short pause for the aforementioned self-worship, with enormous democratic deficits, followed by a permanent state of war, in a hunt for colonies and territory. Then World War I, and then a generation of civil war, and finally World War II, the biggest bloodbath in history and the most horrific crime against humanity ever. Then the division of Germany, a democracy gifted by the Allies, without full sovereignty. By the time the Allies had left, Germany had long been part of the European unification project, part of post-national development on the basis of the transfer of sovereignty to supra-national institutions in Brussels and Strasbourg. Or think of Austria: old Austria, the Habsburg Empire, was a multiethnic, multilingual construct, a transnational unit that had neither a national idea nor the ambition to form a nation. The small regions that lived together as crown lands in the Danube monarchy combined extensive protection through accumulated size with universal rule of law and a common administration and infrastructure, without so much as attempting to homogenize the various cultures and mentalities. The ideology of nationalism destroyed this construct. And the people in all the countries that then formed independent nations henceforth spent not a single day more happy and more autonomous and free as before; on the contrary, they lived miserable lives under totalitarian systems. Things only got better – freedom and upturn only set in – when these nations entered the transnational community of the EU. That’s not an opinion, that’s a fact: only after their return to a transnational entity did the eastern European nations rediscover freedom and rule of law. And the Republic of Austria itself? The remnant? Can a “remnant” form the basis of a rational and coherent national idea? The remnant of a transnational empire initially became a state that no one wanted. The nationalists tore the Danube monarchy apart and the German nationalists turned the Austrian metropolis into a provincial German town. The flipside to the literature of the “Habsburg myth” is the work of Hugo Bettauer. In the novel City without Jews, for example, you can read it. German-Austria, this ridiculous remnant of a world that had split itself into nations, now sought entry into the great German nation. That may have contradicted historical experience, but it was also historically logical. Nationalism was the brand of universal consciousness in this epoch. If an idea grips the masses, then reality can’t withstand it. Which is not to say that the idea must be rational. At some point, however, experience speaks against such tendencies. As a result of the cheerfully executed entry into the German empire, the Austrians got the chance to enrich themselves as a nation through Aryanization, a chance they enthusiastically took, only to see how a hail of bombs fell onto their brave new national world. That was the second negative experience the Austrians had had with nationalism since it tore apart the Habsburg Monarchy. And what was the conclusion, the lesson that they drew from the double disaster of nationalism? They chose to form a nation. Again. This time, however, it distinguished itself from all its historical predecessors. It distinguished itself from the “communists” and the “foreigners” of the former crown lands, from the Germans, and from the Jews, who if still alive, might come and demand restitution. Rabid patriotism ex negativo – but what was the positive national idea of the Second Republic? The Austrians wanted to build a sovereign state on what remained to as territory; the occupying powers were to shove off. This, the attainment of sovereignty, was only possible if they could clearly distance themselves from Germans, who were the ones guilty for the crimes of World War II. So they said the opposite of what they had said a few years before: we aren’t Germans, on the contrary, we are their victims, we are something quite different, unique, with our own very individual history; in other words we are our own nation and therefore, according to international law, demand our right of self-determination as a free and sovereign nation. Basically, the Austrian national idea consisted of two words: “Allies out!” And in 1955, when the Allies withdrew, the Austrian national idea had run its course. Austria could then have opted to become a state-nation, but no one was interested, since that would have meant anyone could come who pledged allegiance to it – uncontrolled entry, no thanks! And so all that remained was to travesty the concept of the nation to an historically unprecedented extent, and to rally growing support for it at the same time. A mix of former crown lands defined itself as a distinct ethnicity, distinguishing itself from the German nation through an ability to speak bad German. Today, Austria is a country in which 88.5 per cent agree that Austria is a nation. The politicians that pander most aggressively to this belief, which defines itself ever more aggressively as innocent patriotism, are treated as future prime ministers – although there is not a single nation, no matter how big and powerful, not to mention a small one, that alone and in sovereign independence can solve any of the problems that we in Europe and in the globalized world are faced with today. Austria is a member of the European Union but doesn’t comprehend that this has revived the best of Austrian history, transforming it into a model of the future: multiethnic, multilingual, multicultural, administered with a high degree of enlightened rationality, on the basis of the universality of human rights. I can see someone crying “England! England!” Surely England shows that a strong, confident nation can guarantee democracy, rule of law, prosperity, and thriving arts and science? Well, imperialism and colonialism, in other words the export of war, tyranny and repression, are not exactly shining examples of the advantages of national sovereignty and national democracy. Do you know why Britain is the sole European country that still refuses to sign the EU Charter of Fundamental Rights? Because, as a ruling nation in the Commonwealth, it has no desire to be answerable to European institutions for the slavery and child labour that still exist in parts of the Commonwealth. 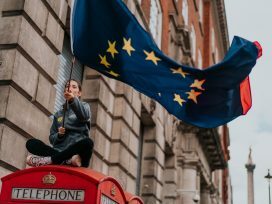 Britain’s national egoism in the European Union, its blocking on a range of European political issues and the constant demands for exemptions, shows how the democratically legitimated politics of one nation can lead to splits and crises in a community, without the citizens of that community being able to do anything to prevent it. I repeat: this is not an opinion. These are facts. The model of democracy that is always assumed when there is talk of democracy or the erosion of democracy, or the deficit of democracy, or the defence of democracy, is the model of national democracy. Indeed, at a particular phase of history it was, as idea and ideal, a possible and practicable model through which to organize the political participation of the citizenry within a territory defined by conquest. This caused it to be so attractive and convincing that people even risked their lives fighting for it. But it was never more than that: a model for the organization of political participation of the citizens of a limited territory, which was then called the nation-state. Speaking against this model of democracy is less the fact that in the nations themselves the people were repeatedly crushed, so much as a fundamental fact: the nation-state is an historical model that arose in a particular historical situation under particular circumstances and set of alternatives – and when those conditions alter, it too, like everything else in history that began at some point, will end. Just like the many other models of democracy that since ancient Greek democracy arose and then disappeared when the conditions under which they arose, and to which they corresponded, altered. The defence of democracy as an idea and as an ambition is therefore, logically, only possible if we accept that national democracy is in the process of dying. Inconceivable? You don’t need a telescope to see it. It’s happening here and now. It’s a process that has been happening for half a century in a particular place, here in Europe; and with a real process in a concrete place, you can’t reasonably talk about a utopia. It’s plain to see, here and now, that the crisis symptoms of this process of transformation are not the product of what’s to come, but the consequence of resistance to it. The one-dimensional European is the person able to understand Europe only as a common market, in which the nations defend their respective interests; the person unable to imagine a future Europe without nations, but also unable to imagine history, historical experience, and to accept the conclusions that were once drawn from it. 5. The Treaty of Rome was the Copernican revolution in the European (and in the long term, global) history of democracy. 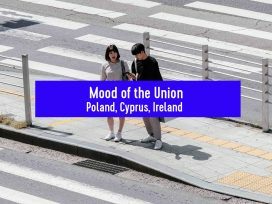 The aim of the founding fathers of the project of European unification, which has provisionally resulted in today’s EU, was explicitly to supersede nationalism and ultimately supersede the nation itself. This is not something I’m merely claiming, you can read it in Jean Monnet, Walter Hallstein and others. This political aim was the logical consequence of the traumatic experiences of nationalism, which laid waste to the continent. But, as it would soon turn out, it was more than merely a decision that could be justified simply by referring to history; rather, it proved to be a far-sighted project for the future, given the global developments that presently and for the unforeseeable future are driving history. No one can deny that what we now call globalization defines all political practice and impacts on all sectors of social life in every place in the world. Today, all the basic phenomena that we have to deal with politically, be they economic or social, have long since been transnational. The power of multinational companies, the financial flows, the chain of value creation, the migration movements, the Internet and the dangers connected to it, like surveillance and the misuse of private data, ecological problems and so on, none of these can be managed within national borders in sovereign independence, nor can they be halted at national borders. Globalization basically means nothing other than the dissolution of all national borders. There is no clear reason why, under these circumstances, political decisions should be made solely nationally and democratically legitimated solely at the national level. 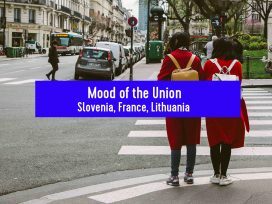 If, in a union whose founding intention was to overcome nationalism, in which the member states have already handed over a whole series of sovereignty rights to supranational institutions, if the first response to problems that arise in that union is to defend national interests, then this contradiction logically leads to crises. This demands a crisis management that, if the chimera of national interests continues to be defended, in turn only produces new crises, which demand ever new crisis summits that cannot solve the crises. What began as a politics with the ambition to shape society became, through the renationalization of Europe, dull, day-to-day politics in the literal sense: today we are rescuing the euro, tomorrow we will rescue the euro again, and the day after tomorrow is a new day on which the euro will be rescued. Exactly the same is happening with the mass refugee and migration movements: today we’re building a fence here, tomorrow we’ll build a fence there, and the day after tomorrow we’ll need to build another fence somewhere else. Nation-states are inundated with rescue packages that are slowly piling up, unopened. 6. And yet the European Union ought to be the leading expert in finding peaceful political solutions to global challenges. After all, in global comparison it has a unique head-start. Europe is the only continent that for over half a century has experience in post-national politics, that deliberately and methodically entered upon a course of post-national development, that created not international but supranational institutions, that in small steps at least has already carried and is carrying out a transfer of national sovereignty to supranational institutions and that, unlike the big nations that behave like world powers, has no interests it is prepared to assert militarily. I say that Europe ought to have this advantage. Because, revolutionary as the project of European unification was, and as successfully as the project began, it experienced a fall from grace that blocked its development and ability to act: this was the Lisbon Treaty. The Lisbon Treaty trumpeted the “empowerment” of the European Parliament without giving it full parliamentary rights, and without calling into question the grotesque situation whereby the European Parliament can only be elected via national lists. At the same time, the Lisbon Treaty strengthened the European Council, that is to say the very institution that defends the various national interests. No decision in the EU can now be made without the consent of the Council, but because in the Council national interests block one another, the whole system is blocked and Union policy impossible save for acute crisis management. 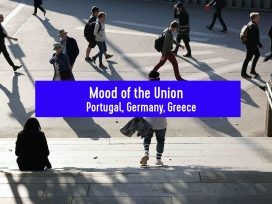 Perhaps you have noticed: all the big crises in the European Union, all the conflicts over EU policy, which only serve to provoke citizens’ anger or confirm their doubts, only commenced after the Lisbon Treaty. 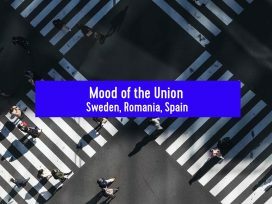 Citizens’ anger towards the EU encourages nationalism, which forces heads of state and government and the ministers of the members states in the Council to make an even greater display of nationalism, which in turn leads to a downwards spiral, to the deepest depths of nationalism that the European project originally intended to overcome. Yes, we must defend democracy, but that will only succeed by overcoming national democracies, by reorganizing the European institutions, and above all by disempowering the European Council, by giving the Commission a clear mandate and granting the Parliament full parliamentary rights. What is at stake is nothing less than a European republic, with the same political, economic and social rights and rules for all, with a completely new, modern and forwards-looking model of democracy. At present, no one knows concretely how this completely new, previously non-existent, world historical avant-garde project – namely post-national European democracy – will ultimately be formed institutionally. To discuss this, with all the fantasy of the dreamer, with all the creativity with which this continent is capable, this is the task that faces us today – instead of encouraging people to raise levels of production dressed in historical costumes that, since 1945, have been neither fashionable nor comfortable, let alone functional. If we fail, the European peace project will be present in Europe merely as the ghost of itself. That is the challenge facing all of us for whom the universalism of human rights is the basis of all political and social action; the respect of human dignity, the recognition of human interests wherever they exist, instead of the protection of the interests of national elites; equal opportunity for the development of individual talent. That is the universal European – whose job is to assert their own sovereignty, rather than defend the sovereignty of the nation. 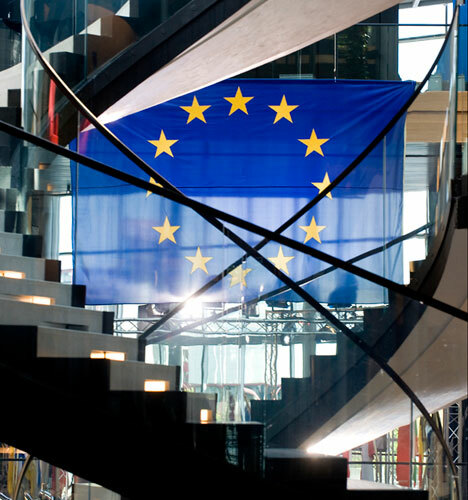 The one-dimensional European is the European for whom the possession of a national passport means that he is entitled to the respect and guarantee of his human dignity and his human rights, and that it is the duty of his nation to take care of this, and in times of crisis to defend his dignity and his rights against the dignity and rights of others. The one-dimensional European understands human rights as a cake from which he alone, with his correct passport, is entitled to the largest piece possible. The one-dimensional European does not grasp that, in times of crisis or conflict, this attitude means he forfeits human rights for himself. Because human rights are either universal or they are nothing, and anyone who considers them to be an exclusive right has already betrayed and forfeited them. Today, he is frightened that the butter will be taken from his bread and tomorrow used as weapon grease. It must soon become clear what type of European is to determine the future: the universal European or the one-dimensional European. However that also means: whether in the future human rights or once again brute force rule on this continent.